There seems to be a storm over at over at the Internet about Microsoft going Cross platform and “opening the common language runtime to a multitude of platforms”. What seems to be a false perception that even such respectable podcasts as Buzz Out Loud or even TWIT fail to realize and mislead people on is that this has NOTHING to do with portable .Net desktop applications. Someone even suggested at one of the BOL podcasts that it’s Microsoft’s attempt to put .Net Framework on Linux servers. (Huh? Beg your pardon?) 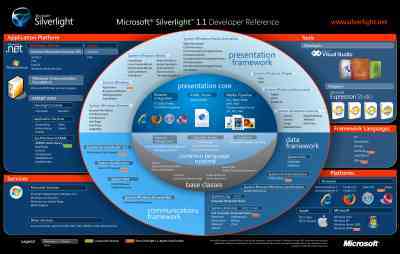 You may have not noticed it but when they say about cross-platform capability of Silverlight it always says Windows, Mac.. and then on a single breath they start enumerating browsers. A casual listener just measures the quantity and the list has an impressive 5-6 bullets. heh… wait… erm… not really… it’s actually only 2 platforms. You cannot enumerate browsers as platforms! You share 99% implementation between them, the only cross-browser thing is the interaction between the plugin and the host browser! As a .Net developer this pretty much makes me laugh through tears. What an excellent publicity stunt. First of all, Microsoft does not plan to release a Linux version. It’s cross-platformedness (is that a word?) refers strictly to the fact that there has been a runtime engine port made for a Mac. What was ported? The CLR and the DLR. Big deal! This has been there in a form of Mono years ago! And the CLR is available for Linux for a few years now. How is that suddenly an exciting thing? If you’re interested in what exactly was done you may want to look at the interview with Scott Guthrie, GM of the Silverlight team. GAC was not ported. Wait! GAC WAS NOT PORTED?! Only a subset of classes that are needed inside a browser. Basic GC, no ASP.Net. It’s nothing like a cross platform version of a full .Net framework. this is also nothing really that new from the cross platform point of view – this kind of stunt was already pulled by Microsoft in form of the Compact version of the .Net framework. Something similar has already been done in terms of XNA – which is a form of .Net framework for XBox. In fact Silverlight is much more like XNA than it is like the full .Net framework. Second of all the only open part is the DLR which is actually developed in an “embrace and devour” fashion. Ruby, Python and the likes developers – we love you! come join us under our Common Language runtime! Of course Microsoft will open it. Those developers are all about open and free this makes a lot of sense doing it this way. Give something, get a lot in return. Don’t get me wrong, I love the dynamic extensions, and I really like what’s being developed in the DLR, but make no mistake, the motives haven’t changed. In the end CLR has been open for a long time and it’s not where the most exciting part of the development is. It’s the framework. I’ve not seen a word about Windows forms being ported. Or any of the ASP.Net namespaces on that mater. Heck even Mono has big ASP.Net 1.0 and chunks of 2.0. If you look at the image where do you see the CLR? It’s the small middle circle inside the big one. That’s a far cry from releasing .Net as a standalone portable framework. And if you think about it, it does not make any sense from Microsoft’s point of view to go the whole way. What for? for it to make Windows expendable? Ridiculous! While Adobe made PDF readily-available to other software companies such as Apple, Sun, Corel, and OpenOffice, when it came to deep-pocketed Microsoft, Adobe took a different stance, demanding that it remove the feature and charge a separate fee. In response, Microsoft agreed to remove the feature, but refused to charge consumers separately for it. Adobe consequently sought negotiating leverage by threatening to sue before the EC, despite the fact that neither Adobe nor Microsoft are based in Europe, neither operates major production facilities there, and neither maintains primary business locations there. Now that we have a few myths busted, I don’t want you to think that I am not excited by Silverlight. It is still incredibly cool that they are doing it and not for the cross platform reasons (although it’s nice), and not for the multi browser compatibility (even nicer), but for it’s roots in the full framework. For us .Net developers it’s like one day we woke up and we knew how to write Action Script (Flash) applications. The Silverlight download is only 5 meg, so in the broadband world it’s going to be on almost every computer fairly quick. We will have a robust development environment for developing those applets in less than a year. It’s root in the .Net framework roots will make it talk seamlessly to our IIS embedded apps and services. You wanted web applications? I can’t wait for Silverlight to turn gold. It’s a brave new world. This entry (Permalink) was posted on Monday, May 7th, 2007 at 7:05 pm	and is filed under .Net Framework, C#, Internet Information Services, Rants, Software Development, Web applications. You can follow any responses to this entry through the RSS 2.0 feed. You can leave a response , or trackback from your own site.